This obscurity is a rather strange one. 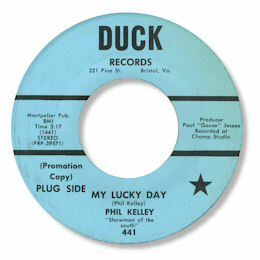 "Unplugged" is not a word I like to see in relation to soul or R & B as the rhythm and the horns often make a record, but in relation to Phil Kelley, who billed himself as the "Showman Of The South", it seems to work. Both self penned sides of this 45 are fine music made by Kelley's super vocals, rich and flexible, full of power and with a lovely raspy tone. Perhaps My Lucky Day just shaves the honours thanks to a more memorable melody. Soul/folk anybody? Or is this just a demo? Anyway the label says this comes from Bristol, VA. Thanks to my friend Rod Dearlove (see Links) for the suggestion.